Background video on Skechers president Michael Greenberg's humanitarian work for the T. Kenyon Holly Award at the 79th Annual Two Ten Gala in New York. 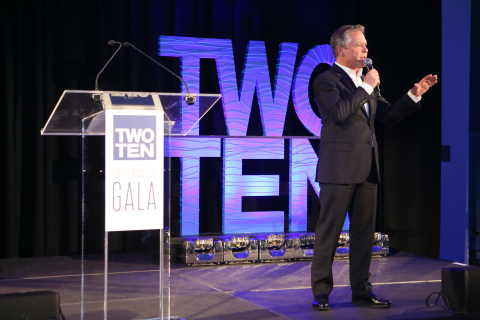 Skechers president Michael Greenberg accepts the T. Kenyon Holly Humanitarian Award at 79th Annual Two Ten Gala in New York. Photo by Natural Expressions. 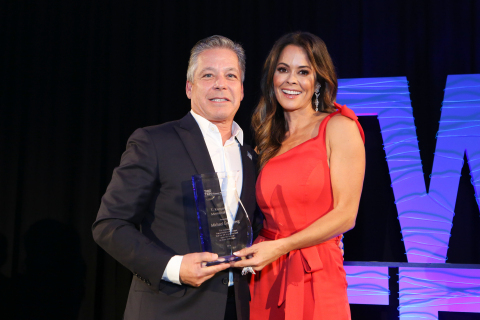 Skechers president Michael Greenberg and presenter Brooke Burke with the T. Kenyon Holly Humanitarian Award at the 79th Annual Two Ten Gala in New York. Photo by Natural Expressions. MANHATTAN BEACH, Calif.--(BUSINESS WIRE)--At yesterday’s 79th Annual Two Ten Gala in New York, Skechers president Michael Greenberg was given Two Ten Footwear’s most prestigious honor – the T. Kenyon Holly Award for his outstanding local, national and global humanitarian achievements for children. Greenberg’s wide-ranging philanthropic efforts have funded education, supported children with special needs, and donated to families impacted by natural disasters. Greenberg saw a need for children with special needs to benefit from a schoolwide mentorship program, and became involved in the South Bay Friendship Foundation in 2005. 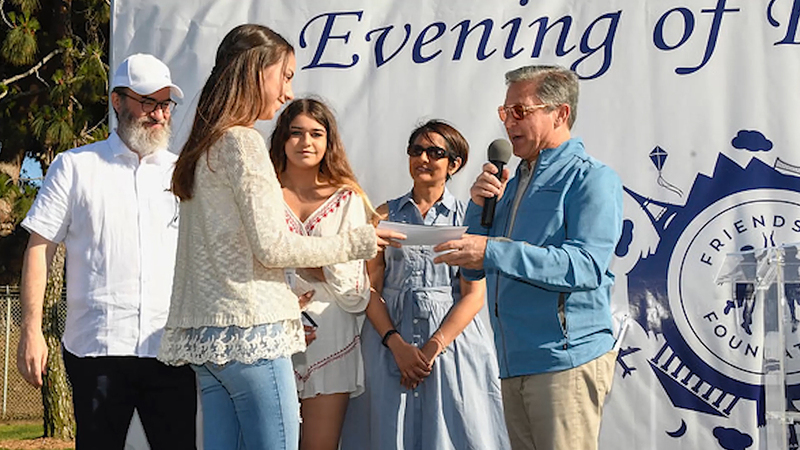 The Foundation has grown into a thriving organization that offers more than 30 school clubs across Southern California and over 60 classes and outings – from trips and summer camps to Dodgers sporting events. To support the Foundation and local schools, he established the Skechers Pier to Pier Walk (www.skechersfriendshipwalk.com) in 2009. Now California’s largest of its kind, the Nickelodeon-sponsored event has topped donations every year since its inception, gathering thousands every October to raise more than $11 million for the Foundation, schools and college scholarships for exceptional students nationwide. In 2014, Greenberg honored his son by establishing the Harrison Greenberg Foundation, which raised $4 million to save and revive the historical Roundhouse Aquarium on Southern California’s Manhattan Beach Pier. Designed by world-renowned architectural firm CambridgeSeven, the new state-of-the-art teaching and experiential destination offers galleries, touch tanks, educational programs and camps free of charge to hundreds of thousands of visitors worldwide, including thousands of children throughout the community – some of whom are learning about marine life for the first time. During Hurricane Katrina’s devastation in 2005, Greenberg reached out to support devastated communities, and has since launched a series of donation events for families affected by national disasters – most recently giving shoes, socks, apparel and backpacks to hurricane victims in Puerto Rico, as well as those affected by last month’s California wildfires. To date, the BOBS from Skechers charity footwear program has donated more than 15 million pairs of shoes to children in need throughout the United States and in more than 60 countries around the world. The T. Kenyon Holly Award is presented to an individual in the footwear, leather or allied industries who exemplifies the spirit and character of the late T. Kenyon Holly, past president of Two Ten Footwear Foundation. Skechers U.S.A., Inc. (NYSE:SKX) based in Manhattan Beach, California, designs, develops and markets a diverse range of lifestyle footwear for men, women and children, as well as performance footwear for men and women. Skechers footwear is available in the United States and over 170 countries and territories worldwide via department and specialty stores, 2,802 Skechers Company-owned and third-party-owned retail stores, and the Company’s e-commerce websites. The Company manages its international business through a network of global distributors, joint venture partners in Asia and the Middle East, and wholly-owned subsidiaries in Canada, Japan, throughout Europe and Latin America. For more information, please visit about.skechers.com and follow us on Facebook, Instagram, and Twitter. Founded in 1939 at 210 Lincoln Street in Boston, MA, the Two Ten Footwear Foundation is the national charitable foundation of the U.S. footwear industry. Two Ten provides emergency financial assistance, natural disaster recovery, educational scholarships, counseling services and professional development programs that improve the lives and careers of the country’s 330,000 footwear employees and their families. The only industry-centric foundation in the country, Two Ten brings the footwear community together to support each other during times of crisis and ensure a bright future for the industry’s workforce. For more information, please visit www.twoten.org. This announcement contains forward-looking statements that are made pursuant to the safe harbor provisions of the Private Securities Litigation Reform Act of 1995. These forward-looking statements include, without limitation, Skechers’ future domestic and international growth, financial results and operations including expected net sales and earnings, its development of new products, future demand for its products, its planned domestic and international expansion, opening of new stores and additional expenditures, and advertising and marketing initiatives. Forward-looking statements can be identified by the use of forward-looking language such as “believe,” “anticipate,” “expect,” “estimate,” “intend,” “plan,” “project,” “will be,” “will continue,” “will result,” “could,” “may,” “might,” or any variations of such words with similar meanings. Any such statements are subject to risks and uncertainties that could cause actual results to differ materially from those projected in forward-looking statements. Factors that might cause or contribute to such differences include international economic, political and market conditions including the challenging consumer retail markets in the United States; sustaining, managing and forecasting costs and proper inventory levels; losing any significant customers; decreased demand by industry retailers and cancellation of order commitments due to the lack of popularity of particular designs and/or categories of products; maintaining brand image and intense competition among sellers of footwear for consumers, especially in the highly competitive performance footwear market; anticipating, identifying, interpreting or forecasting changes in fashion trends, consumer demand for the products and the various market factors described above; sales levels during the spring, back-to-school and holiday selling seasons; and other factors referenced or incorporated by reference in the Company’s annual report on Form 10-K for the year ended December 31, 2017, and its quarterly report on Form 10-Q for the three months ended September 30, 2018. The risks included here are not exhaustive. Skechers operates in a very competitive and rapidly changing environment. New risks emerge from time to time and the companies cannot predict all such risk factors, nor can the companies assess the impact of all such risk factors on their respective businesses or the extent to which any factor, or combination of factors, may cause actual results to differ materially from those contained in any forward-looking statements. Given these risks and uncertainties, you should not place undue reliance on forward-looking statements as a prediction of actual results. Moreover, reported results should not be considered an indication of future performance.